The 34401L Wobble Pump offers solids and slurry handling capabilities for flows from 0 to 15 GPM at pressures up to 50 psi. The simple design of the wobble stator and just one universal joint give low pulsation and shear for use in grout or plaster pumping as well as other thickened mediums with solids or abrasive content. The Long-Coupled Version is available in Cast Iron with standard Buna Nitrile Stator and a hard-chrome plated rotor for long service life. The pump is available with a standard mechanical seal for abrasion resistance. 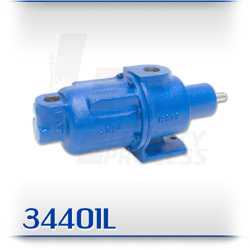 Replacement parts for the 34401L series are available for immediate shipment from Liberty process inventories and all pumps are offered “off the shelf” from our inventory for immediate shipment.